There is a date this year in autumn you should keep in mind: the release of Marcel Knopf’s first album on Mo’s Ferry. Being a DJ Marcel Knopf is used to fathom genre boundaries and now and then he dives into Dubstep, Electronica and realms of Pop. With the single „dusty dance“ you get a foretaste of the upcoming congenial longplayer. In its own way, his single enables an acoustic addiction of a thrilling style mix. 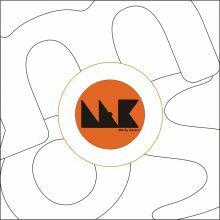 These two tracks move in between smart Techno and grooving illustrious House and points out, that Knopf doesn’t want to be bound to one musical direction. The title track and A-side of the single „dusty dance“ is one of the floor fillers of his album. Get ready for an enthralling groove, a monster break and a hook, where any bias against trumpets in the club is blown away. On the B-side you’ll find the oldschool frickling House track „rec-chord“, which reflects Knopf’s addiction for the beloved vinyl format. Go out and get yourself a physical copy, to hear this nice and comfortable sizzling noise. It’s the best way to get a charming club feeling. And always remember: who buys first, may listen longer!